EXPANDING its temperature sensor product portfolio, Microchip Technology has unveiled two high-accuracy, high-resolution digital thermal sensors, both featuring an SPI interface, that are suitable for a wide range of wireless, networking, handheld and computing applications. Referred to as the TC77 and the TC72, the thermal sensors are able to read temperature without the need for any external components and communicate thermal data via three and four-wire industry standard interfaces, respectively. The TC72, offered in the 8-pin 3x3-mm DFN and the MSOP package, and the TC77, offered in the tiny 5-pin SOT-23 and the 8-pin SOIC package, enable designers to save a significant amount of board space while improving temperature sensing capability. The DFN package has a lower profile, as well as significantly better thermal resistance than standard package types and also provides designers improved ability to manufacture through the elimination of conventional side leads. Both sensors consume the lowest operating current (250μA typically) for a given temperature conversion time in the industry. This combined with the ultra-low power shutdown mode (1 microamp typically), enables designers to extend battery life in portable electronics. The TC72 is capable of reading temperatures from -55°C to +125°C and features an operating voltage range of 2.65 to 5.5-volts. Temperature resolution for this device is 0.25°C per bit and temperature accuracy is 2°C maximum over the entire -40°C to +85°C temperature range. The TC77 offers very high-resolution (0.0625°C per bit) enabling systems to quickly detect critical thermal conditions, which leads to precise temperature measurement. The device offers an extended temperature range of -55°C to +125°C and an operating voltage range of 2.7 to 5.5 volts. The TC72 is available now in the DFN-8 package and the MSOP-8 version. 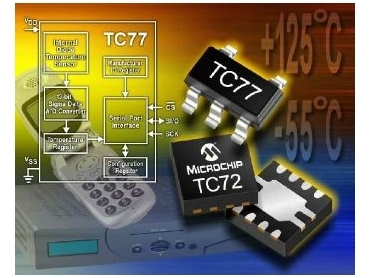 The TC77 is available in the SOT-23-5 package and the SOIC-8 version.